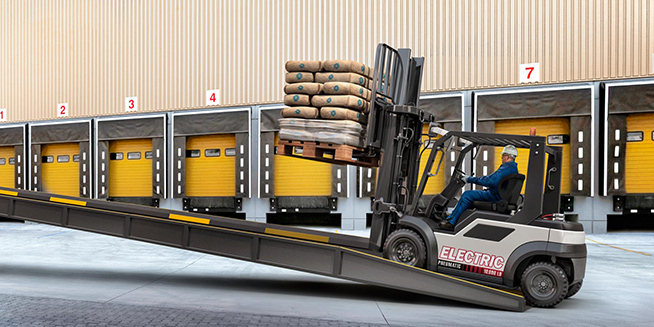 Advanced electric motors and long runtime EnerSys® batteries provide electric lift trucks with all the power and performance of Class 4 and 5 internal combustion (IC) trucks, with none of the drawbacks. Electric lift trucks perform in operations that were historically supported only by IC, including heavy demand and multi-shift. Electric outperforms IC in critical metrics, like lift speed and Right Angle Stack. Electrics feature tighter turning radii, allowing narrower aisles and more racks. Electrics lift the heaviest loads, indoors and outdoors. Electrics perform on inclines, ramps and grade changes. Better visibility, less noise, and less vibration mean less driver fatigue and higher productivity. See how converting to electric gets your job done.